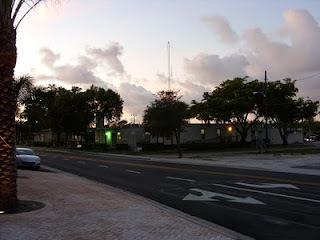 In this picture, the Sun is rising over old City Hall in Wilton Manors. In reality the Sun is setting today. Today is the last day of business at this building for the City. The police have officially moved to new City Hall as of 7AM although people will be moving their boxes for weeks. 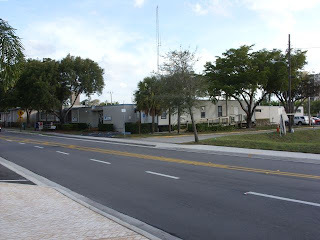 The people of Wilton Manors have paid for and built a new City Hall just on the other side of this tract of land. Being on the Community Affairs Advisory Board as a member, I have had the pleasure to have been invited at the pleasure of the Mayor and the City Commission to be at the Grand Opening and visit the new City Hall and have a self guided tour, basically an "All Access Pass". I can say that the new building is a much more modern and up to date structure than the old one, certainly much more up to date, and will serve us in times of good and bad. The structure is built to shrug off a direct hit by a hurricane with winds up to 160MPH, has adequate storage, more than adequate office space, and is built to accept a Modern IT Infrastructure. Here you see the old building in a more sunlit view. The building itself was too small for the people who worked there. Having visited the place and many of the offices, I found myself wondering how they could have managed through out the time it was there. Under the trees in the right of the picture is the HR Offices. Rather, better said the HR Trailer. Should a storm hit, Wilton Manors HR documents would be spread out from here to the Ocean or the Glades or both. The building wasn't strictly speaking "Bad" but it was build to service a much smaller city back in the 1950s. We're now 12,800 people strong here, by the 2000 Census. Coming from a place who's City Hall was built in the 1880s and is known to be a National Monument, I understand that a building merely 50 years old could have had another 200 years life in it. In the case of City Hall, to make it work, they'd have to build on wings and double the size as well as run Ethernet Cable all over the place. The building simply did not work any longer. My hope is that once everyone has had their things moved, and before the wrecking ball comes to flatten this for a parking lot, someone from the Historical Society, and myself, get full access to the building and take as many pictures as can fit on the camera as possible. I've been meaning to mention this to my friends on the Commission and the City Manager, my fault, I'll get on that email as soon as I can find the right email addresses. It is an old building, used up and ready to go, but it would be a shame to have it go without at least a decent recording of what it looks like today. This would be one of the views I had of the old Commission chambers. One of the quirks of the building is that it had a little lift for the City Clerk and Assistant. One of my quirks is that I have bad knees that are pretty much constantly in some sort of pain. 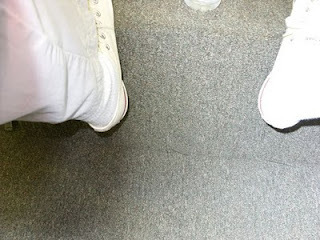 This little lift became a home for my feet in every meeting, it became one of the oddball things that people commented about in the city. The new chambers will have comfortable padded seats, a brightly lit room with adequate space, and properly set up from an audio-visual standpoint. Truly a modern Commission Chambers. The old room was a former two-bay Fire Engine Garage that was converted to that purpose. Semi Circular dais where the City Commission and the other boards, including mine sat, all wrapped in the most modern wood grained Formica that the 1970s could buy. The new chambers has painted walls, sound deadening panels, and an almost flat dais which will probably reduce the amount of interaction between board members. I'm looking forward to Wednesday Night when my board becomes the first board to ever hold a scheduled meeting in that space and see how it all works. Probably best that they don't have the Commission in there first, we'll report back the bugs and let you all know how it went.